As I found myself flipped over my handlebars in my first race — and then smashed against a wooden course marker in my second race — I couldn’t help but laugh. The same way you might laugh when faced with a black diamond slope, a nearly vertical ascent to a sought-after summit, or the realization that you’re only halfway through your marathon and you can no longer feel your legs. That’s how I felt as a newbie in Oregon’s cyclocross scene this year — a classic Oregon experience that finds its greatness in the fabulous mix of fun, competition and cameraderie. It’s grown from a smallish scene in Oregon just 10 years ago to a huge underground culture that attracts close to 1,500 at some of the larger races. From Portland to Corvallis, Bend to Ashland and many places in between, ‘cross attracts competitors of all ages, shapes and sizes. There’s a category for zippy teens, wizened 50-plus “masters” and 200-plus pound “Clydesdales,” along with the Lycra-clad everyday road warriors. In my beginner category there are soccer moms in flat pedals like me, as well as mountain bikers or road racers trying something new. There’s even a category for single-speed racers; incidentally, the 10th anniversary of the gleefully irreverent Singlespeed Cyclocross World Championships will be held in Oregon, Dec. 3-4, 2016 at Kruger’s Farm in Portland. As I talked with the other beginner women at the starting line at the Grand Prix Brad Ross race and season’s first Portland Trophy Cup event — two of Portland’s most popular race series — they admitted they were all there to face their fears. Most, like myself, were dipping their toe into the sport after they’d been part of the action on the sidelines, cheering on their significant others. 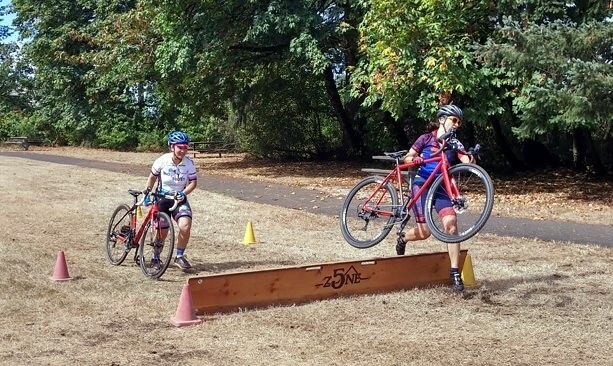 Many take advantage of the free beginners’ clinics held early in the season, where pros teach the cyclocross basics: dismounting and remounting when crossing a barrier, cornering tight turns in loose gravel and dirt (often mud), managing steep uphills and downhills and more. Molly Cameron is one of those mentors who is ubiquitous in the local ‘cross scene. 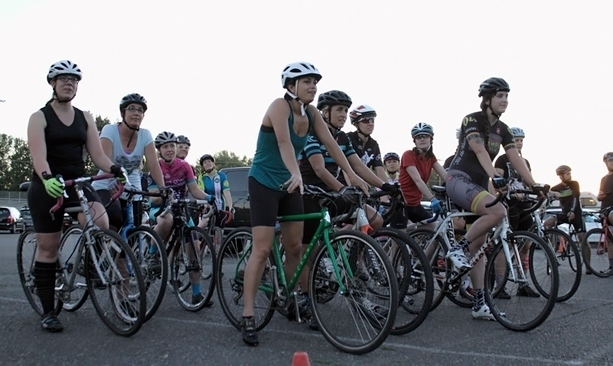 A veteran racer and owner of Portland Bicycle Studio bike shop, she runs two elite women’s bike racing teams and spends the early part of the season leading beginner clinics several nights per week in Portland. Her constant advice: “Just keep going forward and try to stay upright,” no matter what. Molly is also transgender, born a man but identifying as a woman. 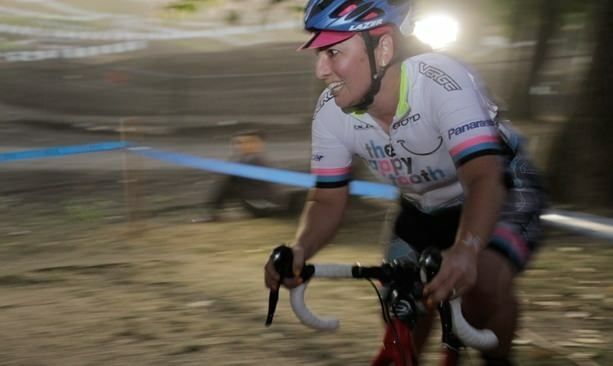 She’s made national headlines in past years as a vocal activist for equality in bike racing; thanks to her, women racers’ prize payouts are equal to men’s in Oregon, and public awareness of trans issues has increased. While Molly was gracious enough to lend me a top-of-the-line carbon fiber Norcross bike from Blue Bicycles, her team’s major sponsor, newbies don’t necessarily need fancy custom gear to get into the sport. Don’t have a ‘cross bike with thick, knobby tires and fancy disc brakes? No problem. Not feeling the fitted gear? Come as you are. If you run into a mechanical problem, just pull up to the pit and a course marshal will help you with a spare bike or tire to get you through the race. It’s accessible enough for novices like me, yet challenging enough for elite racers who work at sharpening their skills and honing their strategy to improve lap after lap, course after course, season after season. It’s addicting. After my first race I found myself reliving the pure adrenaline rush of flowing downhill at rocket speed, brakes applied less and less each time, only to quickly switch gears and prepare to swing off my bike to push it up a sickeningly steep hill that seemed to last for eternity. The raucous crowd at the top, with their cowbells and lines like “I don’t even know you but you’re so awesome” kept a smile plastered on my face that carried me well into the next lap. For details, check out the Oregon Bike Racing Association. See you on the course!